The other day I came across a picture from late 2007 (back then we called them pictures, not selfies.) I didn’t like the picture at the time, so I’m surprised I didn’t delete it immediately. But now, I would give my left arm to have the supple, plump, glowing, collagen-rich skin I had in that picture. 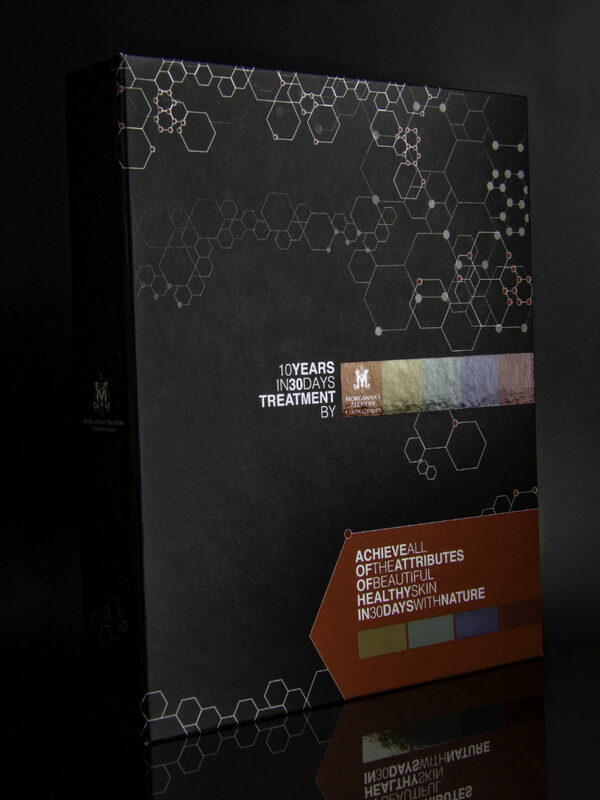 Fortunately, I get to keep both of my arms thanks to Morganna’s Alchemy 10 Years in 30 Days Treatment Kit. 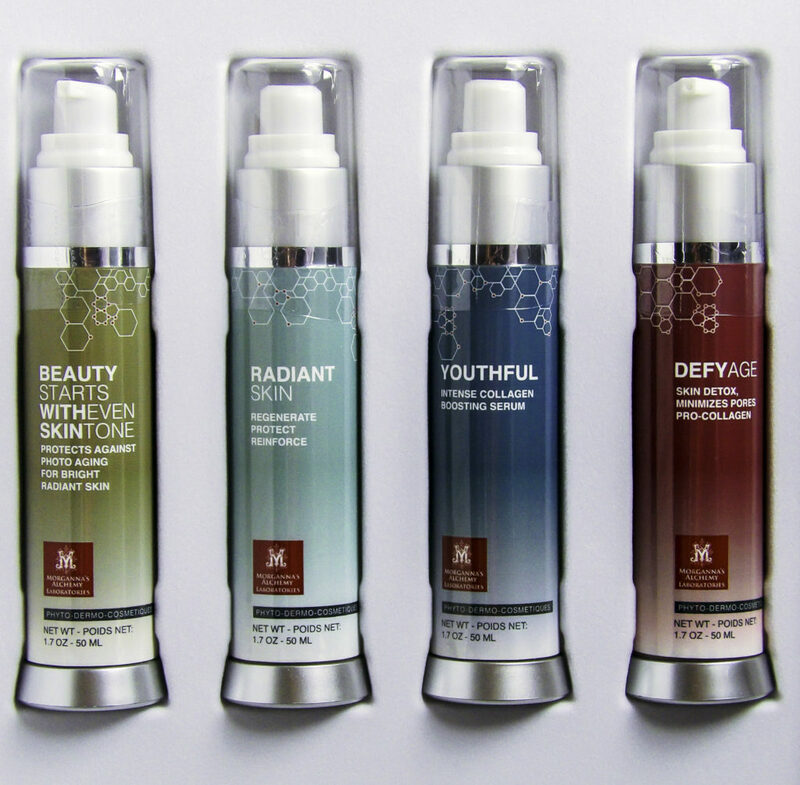 This innovative kit targets the major signs of aging and leaves beautiful, youthful skin. It isn’t a radical treatment regime, it is just you, but better. Ten years ago better. While you had me at the promise of taking ten years off my face in 30 days, I have to wonder how exactly that’s going to happen. Well, we tried the kit ourselves and I am pretty impressed both with the approach and the products. And you can try it too, enter to win your own free Morganna’s Alchemy 10 Years in 30 Days Treatment Kit in our giveaway. See the Style Chicks Instagram for details. Want to know what makes Morganna’s Alchemy 10 Years in 30 Days Treatment Kit special? Read on! A certain benchmark birthday prompted me to buy and use all the anti-aging things at once. This overkill plan backfired, too many products all at once were too rough on the skin. There are many effective, fantastic products to target very specific concerns, such as wrinkles and fine lines. But in all likelihood, after the fine lines are addressed, one won’t suddenly be mistaken for once again being a high school student. Youthful skin is more than just the absence of these signs of age. And capturing this elusive reversal in skin time requires addressing what is actually making skin look, well, not young. And it isn’t just your crows feet. This is where Morganna’s Alchemy 10 Years in 30 Days Treatment Kit comes in. 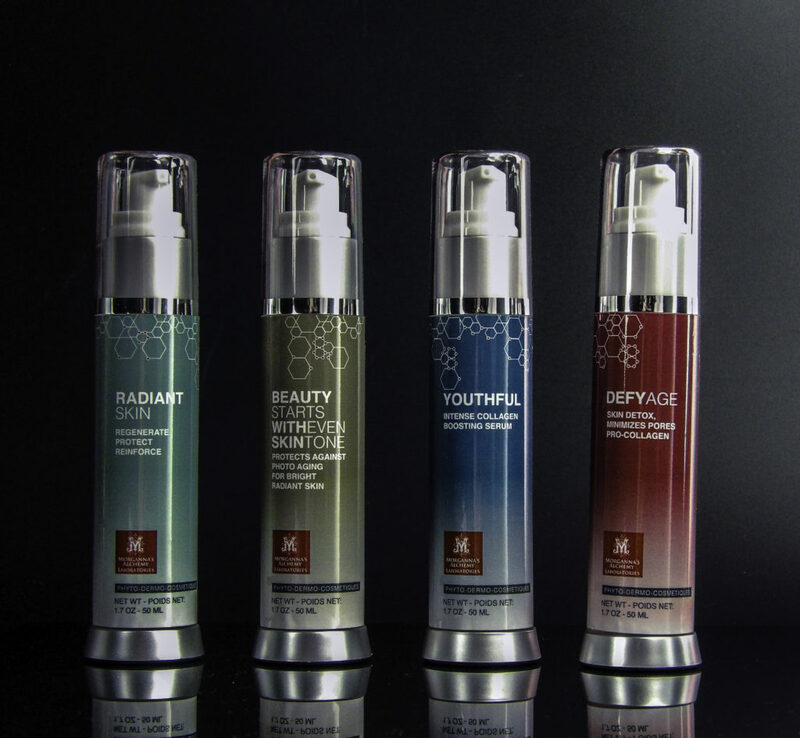 Morganna’s Alchemy 10 Years in 30 Days Treatment Kit is different than the way I thought of anti-aging skin care, but now that I have used it, I can see why other specific, targeted skin concern products couldn’t accomplish the overall appearance of youth. Despite all that I look at my face, I didn’t really understand what made me look older. I couldn’t see the forest for the trees, so to speak, and I focused only on the individual manifestations of age. That approach is shoveling against the tide, and at best leaves one looking not actually younger, but “good for their age”. I hate that phrase. 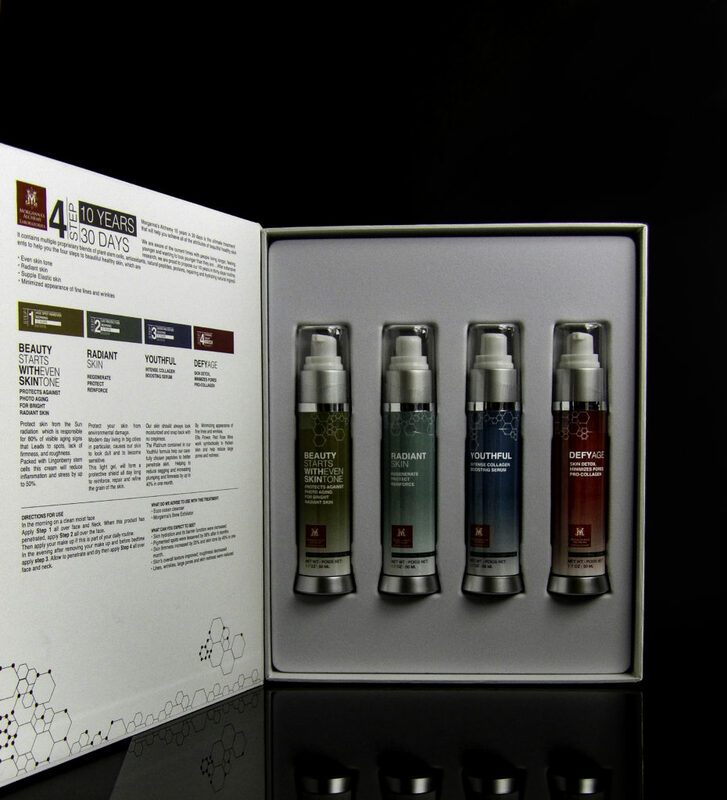 Morganna’s Alchemy 10 Years in 30 Days Treatment Kit addresses both the source and the symptoms of aging skin. This approach has an excellent success rate on targeted concerns including skin hydration, pigmented spot reduction, skin tone, skin firmness, texture, and a reduction in roughness, redness, enlarged pores, lines, and wrinkles. When one thinks of aging, do you think wrinkles? Sagging? These are factors, but not entirely what makes us look older. 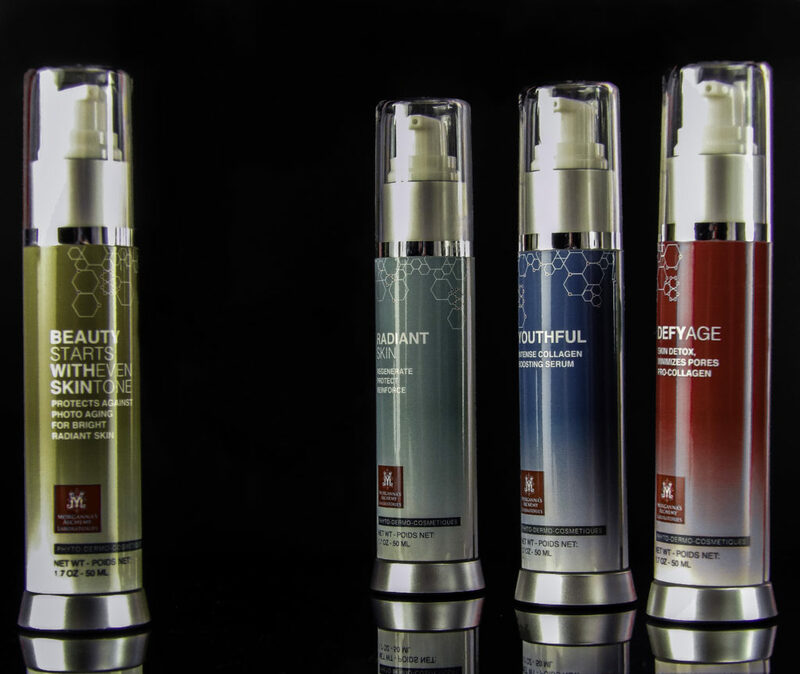 Morganna’s Alchemy addresses the four chief factors of aging skin. The biggest factors are discoloration and roughness from sun damage, environmental pollutants causing dullness, and *THEN* crepey skin/sagging and wrinkles. The worst amongst them is sun damage and the resulting discoloration and rough skin patches. A whopping eighty percent of what ages the face. YIKES. Have you seen Anthony Cerniello’s “Danielle“? It’s an artists’ simulation of a female gradually becoming older over time, the real aging of the face occurs when the discoloration and dullness happens, not the gray hair or the wrinkles. The two images below are screenshots from this video. You will notice she has some drooping, binasal folds, undereye bags, even when her face was young. Notice the big change in tone and texture in the second photo. Digitally altered face shown aged at the onset of skin discoloration. The discoloration makes the face seem harder and sterner, doesn’t it? And the dullness makes her look so tired. The skin tone, redness, and rough patches belie age more than the wrinkles. If she used just a wrinkle cream, would she look much younger to you? When makeup artists’ “age” a young actor for a movie role to make them look old, they emulate aging with applying discoloration into the contours of the face and obscure the natural vibrant look of young skin. Even wrinkles look older because of the discoloration in their valleys making them appear deeper and more prominent. So they “paint on” what sun damage and environmental factor do to skin over years of time. So we need to stop THAT from happening ASAP. That is where Morganna’s Alchemy 10 Years in 30 Days Treatment Kit comes in. The directions on the back of the box are simple to follow. Apply Steps 1 and 2 in the morning before makeup, and Steps 3 and 4 in the evening before bed. The smell is natural but dissipates, my makeup went on smoothly over the products without being oily, tight or tacky. Both morning and night my skin feels and looks smooth and hydrated. I like how it makes my skin appear immediately – soft, dewy and supple. Morganna’s Alchemy Step 1 is to even the skin tone. The product is designed to protect the skin from sun radiation. This step alone makes a surprising difference. I hadn’t realized how much discoloration I got overtime on the top of my cheekbones and on the cheek area below the eyes, lots of little freckles and spots that made the overall contours of my face seem not like my own face. The collective impact of all those tiny discoloration spots was an overall darkening on what should be the lightest part of my face. It was as if I applied contour or bronzer where there should be a highlighter. Sun damage causes spots, lack of firmness, and roughness. It does this with a gentle but effective natural ingredient: Lingonberry Stem Cells. HOW DOES IT WORK? Lingonberry stem cells increase natural antioxidant mechanisms of skin cells and decrease skin irritation and inflammation, a fantastic combo when seeking to remove unwanted discoloration and get your natural skin tone back. Lingonberry is a “superfruit” rich in vitamins C and E, both excellent for repairing *AND PREVENTING* sun damage on the skin. RESULTS: I find this product is far more gentle to the skin than other products geared towards discoloration. It does not sting or irritate my skin, even when used with other Morganna Alchemy products. My skin is not dry, itchy or peeling, but the discoloration looks much better. While I have been a sunscreen devotee since my twenties, one cannot fully escape the effects of sun damage and I am excited to see some discolored areas on my cheekbones fading. You probably have seen gray-haired women with plenty of wrinkles and while you wouldn’t mistake them for 20, they still look younger than their years. How? Likely, their skin is vibrant, glowing and not dull. No amount of highlighter or dewy makeup trick and fake the vibrant glow of youthful skin. Step 2 is designed to protect skin from environmental damage. It is applied once Step 1 dries down. It goes under makeup. HOW IT WORKS: Environmental damage makes skin dull and sensitive, which leads to redness and inflammation, which in turn, makes one look older still. Fortunately, skin can recoup from environmental damage if given a chance. RESULTS: Step 2 is a light gel that serves as a protective shield all day while it repairs and refines the skin, allowing it to get its’ glow back. I have always considered my skin sensitive, but now that I have had Step 2 as a protective barrier on my skin, I think it is more likely that my skin was aggravated by environmental irritants. Step 1 and Step 2 address issues you may or may not have realized are making skin older. Step 3 and 4 address target areas you may already be treating but may wish for better results than you have acheived to date. If you pinch your skin, what happens? Young skin snaps right back, older skin takes a bit longer. When our skin lacks moisture and loses collagen it becomes deflated, resulting in a sluggish sort of crepiness and sagging. While there are plenty of skin-friendly ingredients in Step 3, the star of the show is Platinum, which binds to the peptide ingredients and helps them penetrate into the deepest skin layers. It is this layer where sagging can be repaired by these peptides that boost collagen production. Any collagen you can get helps, but most topicals can’t reach this deep of a skin layer, so their results are superficially helpful but not so great for reducing sagging. 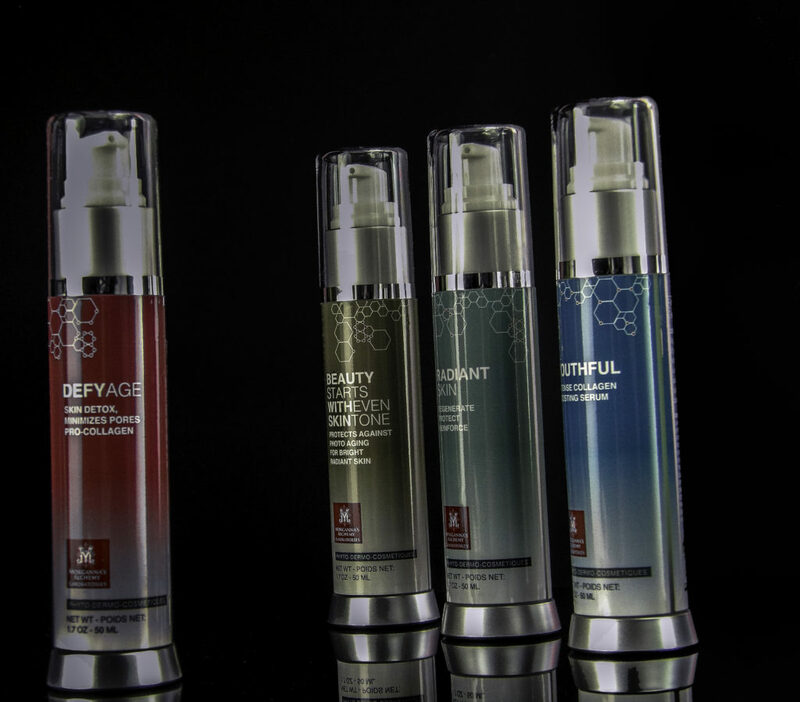 The deeper active ingredients like peptides can get into the skin and make collagen, the better. Once you can get hydration and peptides deep enough into the skin to re-plump or re-inflate from the lost moisture and restore the collagen, it firms up quick, sagging skin becomes up to 40% firmer in one month. RESULTS: Skin does quickly seem more hydrated and supple. I would not have thought of myself as having dehydrated skin but I can’t argue with how much more supple it looks now. Extra collagen production gets better and better over time, I am 14 days into my 30 days as of now, and I am excited about this Platinum plus peptides collagen producing combo! 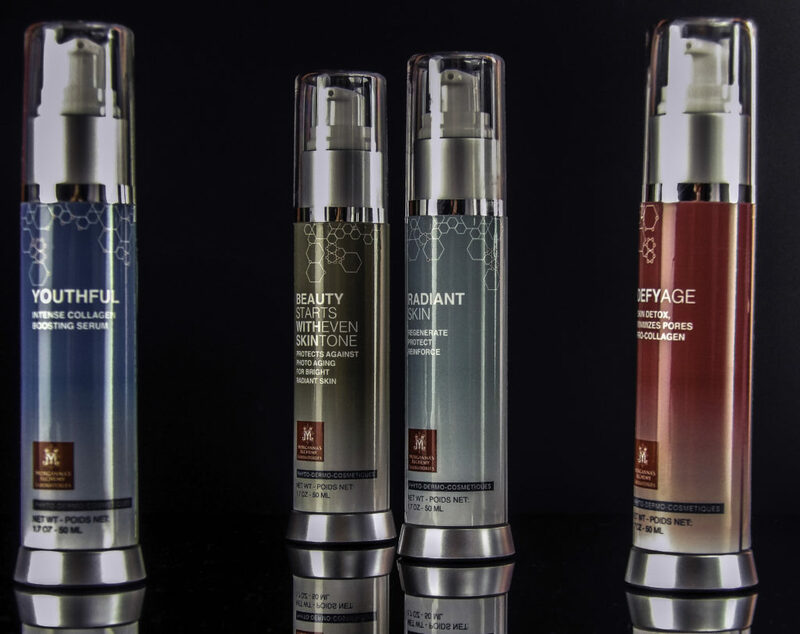 DefyAge tackles the issues you can likely see on your skin right now, enlarged pores, redness, fine lines. It minimizes the appearance of all of the above using Elfe Flower and Red Rose Wine to thicken skin. 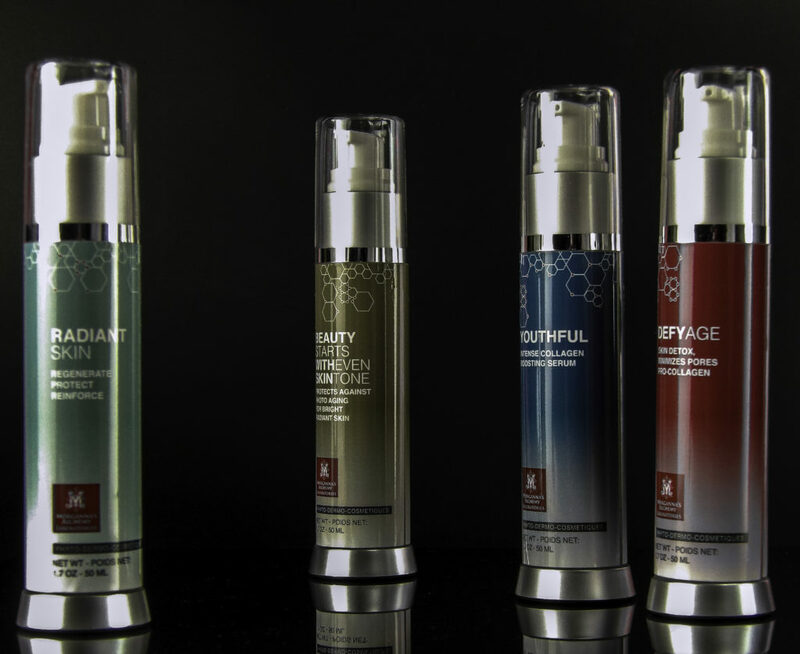 These anti-oxidant powerhouses not only make the skin less subject to new wrinkles but reduce large pores and redness. RESULTS: Redness around the nostrils, and eyes sneaks up on you, and does make one look older. The idea of thickening the skin is wonderful to not only help old wrinkles but to prevent new ones. 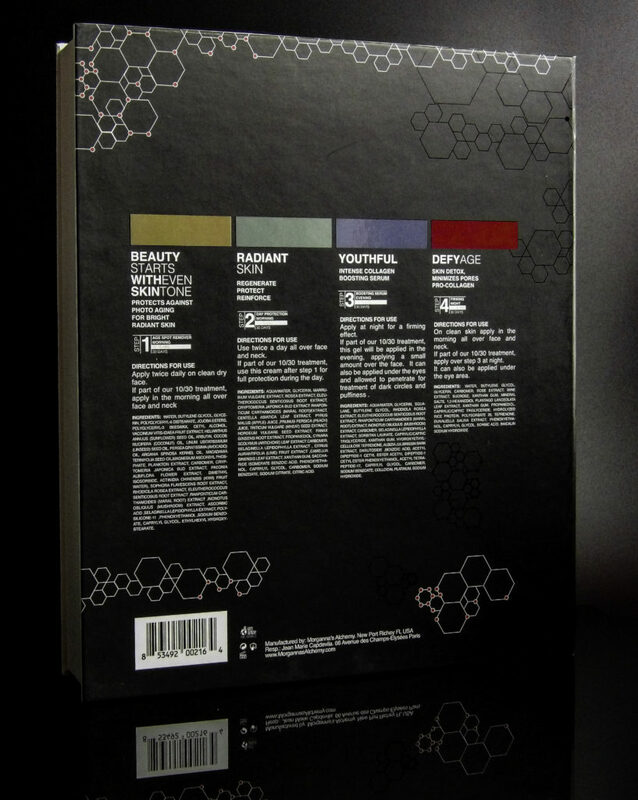 So that is our impression and overview of Morganna’s Alchemy 10 Years in 30 Days Treatment Kit. What a kit! This is an easy to use system, with all-star ingredients, combined into highly effective treatments for impressive results that restore a youthful glow, remove sun damage and give a healthier look to the skin. It is effective without irritating or drying the skin, my skin was soft during the entire process, not peeling, red or irritated. It addresses skincare needs that I didn’t even realize I was missing and the result is hydrated, soft skin that looks like my skin, but lovelier and younger. Don’t forget to enter the free Style Chicks Instagram Giveaway for a chance to win your own Morganna’s Alchemy 10 Years in 30 Days Treatment Kit! Style Chicks received Morganna’s Alchemy 10 Years in 30 Days Treatment Kit for review purposes and received compensation for our time and effort. However, our experience with the product and the opinions expressed in this review are 100% ours.